You could see drought all the way from Austin to the barrier dunes of Malaquite Beach at the northern end of Padre Island National Park. Couldn’t find a single crab, last year’s BP oil spill maybe? 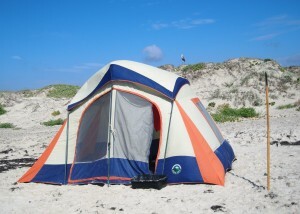 Where I pitched the tent, a great blue heron stayed close. I was glad to share his rookery, left it in better shape (picked up the plastic).